You may be surprised at the places that homeowners discover bees. Besides the frequent honeybee swarm in a tree, ASAP Bee Removal has responded to calls about bees in barbecues, brick walls, cabinets, water heater bases, fountains, birdhouses, doghouses, spa surrounds and cars. We have removed bees from planters, tires, bikes, bird baths, and belfries. Water valve boxes are also very popular with bee swarms. One of our personal favorites was a swarm on the face of a statue. We are pleased to be able to remove honeybees alive whenever we can. We use temporary housing that one of our beekeepers can pick up, take to their yard and begin to re-house these swarms. We are also able to release bees into more remote desert areas so that they can naturally reestablish hives away from urban settings, which can be dangerous to both bees and humans. 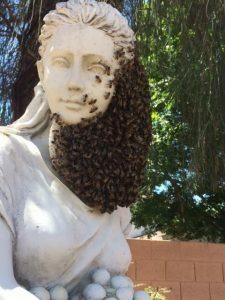 As you know, Africanized bees are prevalent in Arizona, and we get calls from homeowners referred by local fire departments recommending a bee exterminator. These bees have attacked without warning when irritated by a lawn mower, pets, kids playing, or when unexpectedly disturbed. Unfortunately we have seen many dangerous and tragic circumstances in our nearly 20 years of service. Many of the aggressive situations are a result of homeowners either not noticing a bee hive, or simply ignoring it, hoping they will “go away”. It is very rare that bees will spontaneously leave once established, and the longer they stay, the more territorial and aggressive they become in this urban setting. This is why we recommend that homeowners call for bee removal as soon as possible. We suggest that homeowners regularly walk their property looking for bee activity. Persistent honeybee traffic coming and going from one location such as those mentioned above, as well as foundations and rooflines, and shed floors, is a sure sign of bee infestation. ASAP Bee Removal can give free expert advice. We will give an honest appraisal over the phone, and determine if you need to act. Many times we tell customers that it sounds like they have normal bee activity and no action is needed. Other times we encourage them to wait a day. We never recommend a DIY project where bee infestations are concerned. ASAP is a full-service bee removal company. We can locate and remove bees in any situation. When bee extermination is necessary, we can remove the hive, deodorize, insulate the area and repair the damage. Call us at 602-751-1002 for more information.